The market was valued at USD 779.5 million in 2017, and it is expected to reach a value of USD 5,428.4 million by 2023, at a CAGR of 40.2% during 2018-2023. Owing to the wide variety of operations they can perform in the current scenario, Unmanned Aerial Vehicles (UAV) have made significant strides since their inception. Engineers have been identified to harness the capability of UAV, to collect visual and thermal data over vast areas, at a much higher precision than before. With appropriate data analytics, this information is being used by the military for various purposes, which include security and control, aerial reconnaissance, access chemical, biological and nuclear conditions, and to strategize the required measures. In addition, with each passing year, UAVs have turned out to be more cost-effective than regular fighter planes, thus driving their adoption. Although drones might never replace human pilots, its benefits over conventional fighter planes are propelling their adoption in various countries, thus driving the market's growth. The US military, under the Trump administration, is planning to integrate AI and machine learning into their military equipment. This integration of advanced technologies helps the military turn massive volumes of data into intelligence and insights, and enable the military to formulate strategies. The US military is planning to test a new system prototype by mid-2019, which includes underwater drones and unmanned army trucks. This trend of AI-powered automated vehicles is expected to continue, as the country is making steady attempts to pursue various forms of automation that reduce human-generated costs over time. In addition, the US military is also making concentrated attempts to strengthen its drone sector. The Department of Defense, has requested approximately USD 6.97 billion for the fiscal year 2018, for drone procurement, research and development, and system-specific construction. This is the highest requested budget over the past five years, and USD 3.3 billion more than previously predicted. The drone spending in PB18 is expected to be 21% greater than the enacted 2017 drone budget. 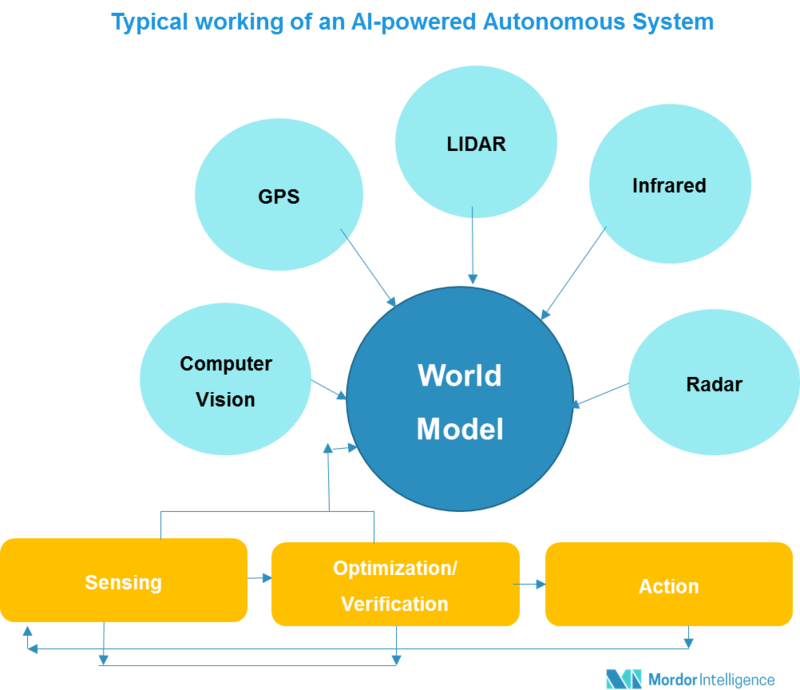 The above-mentioned trends indicate the extent of emphasis the US military places on enhancing its UAV's division, and the attempts it is making to integrate AI into modern warfare, thus driving the market's growth in this region. Major players : The Boeing Coany, General Dynamics Corporation, Alphabet Inc. (Google Inc.), IBM Corporation, Intel Corporation, Endeavor Robotics, JSC Kalashnikov Concern, Lockheed Martin Corporation, Northrop Grumman Corporation, FLIR Unmanned Aerial Systems, Dassault Aviation, Raytheon Company, Roboteam Ltd, SparkCognition Inc., Stryke Industries LLC, and Textron Inc among others. Oct 2017 – FLIR systems was awarded a contract worth USD 74.7 million for land surveillance system, by the US Army. Aug 2017: The US Air Force awarded two separate contracts worth USD 718 million to Boeing and Northrop Grumman Systems, for the development of preliminary designs for the country’s next intercontinental ballistic missile (ICBM). 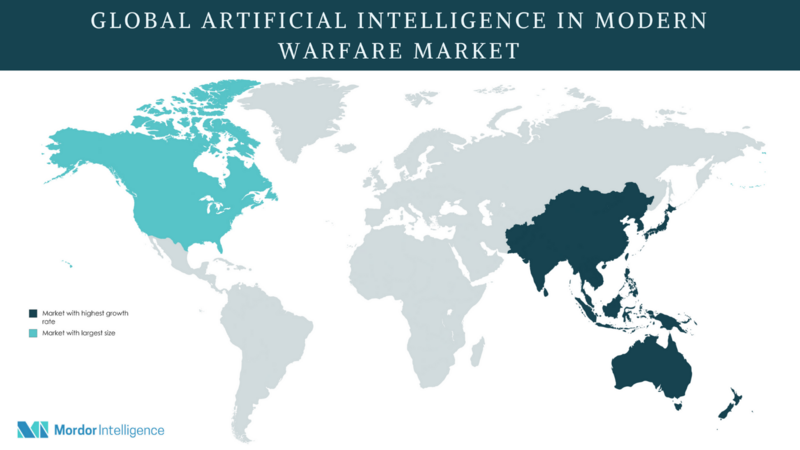 Understanding how the rise in value of human life could affect the growth of the artificial intelligence in modern warfare market. The equipment type that is expected to dominate the market.